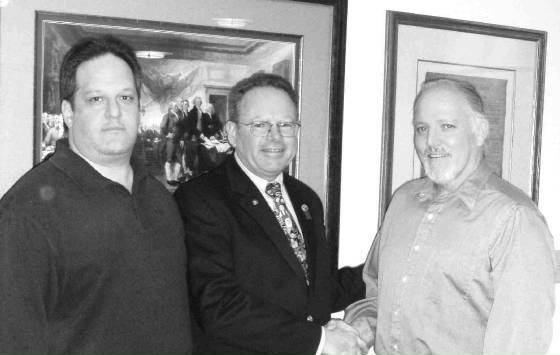 Passing the mantle: Jim Jeselnick (second from left); founder of Quality Search Personnel, passes the mantle to business associate and friend, Jeff Wolfe (right), who recently purchased the firm from Jeselnick. Quality Search specializes in the recruitment of professionals for the packaging industry. They are "joined by Patrick Kepchar, the firm's CPA and business consultant who helped to facilitate the sale. Jeselnick established Quality Search in 1981. After more than a quarter of a century in the professional recruit­ing business, Jim Jeselnick is calling it quits. Today, Jeselnick announced his retirement and the sale of Quality Search to his long-time business associate and friend, Jeff Wolfe. Jim Jeselnick started Quality Search in November of 1981 after a stint as a high school English teacher in the Duneland System and retires after nearly 26 years of' suc­cess serving the Professional Recruiting needs of the Packaging Industry. Wolfe joined Quality Search in 1988 after an 18-year career with Xerox Corporation, where he worked in both sales and sales management. Wolfe left Quality Search in the 1990’s to return to the corporate world but found he missed the satisfaction of helping people in their own careers and so returned to Quality Search. Jeselnick said that he plans in retirement to pursue his other interests. Among other things, he is active in the Chesterton/Porter Rotary Club, where he is the District Governor-Elect. He is also an avid golfer and e-Bayer.